Agriculture in Abia: "A Haven For Investors"
Abia State is an agricultural investor’s delight. With fertile lands and located in the rainforest belt of Eastern Nigeria. Most crops do very well in the state. The State had numerous commercial agricultural companies but most of them packed up over time due to mismanagement and corruption. The company, which has already revitalized the Mbawsi Oil Mill as a show of its capabilities, are set to turn the fortunes of the vast Ohambele Palm Estate around. The State Government has equally acquired land at Okwoi for the pilot project of massive planting of plantains and bananas using the Songhai Farm model in conjunction with the Catholic Diocese of Umuahia. INVESTORS ARE INVITED TO CONSIDER TAKING OVER AND REVITALISING THE FOLLOWING MORIBUND GOVERNMENT-OWNED AGRICULTURAL CONCERNS. Project – Poultry production, Cattle, Piggery, Sheep and Goat Rearing, Honey Production, Fishery and sundry related products. 100,000 improved oil palm seedlings, which has been distributed to Abia farmers. 55 Tractors acquired for distribution to farmers in Abia State. 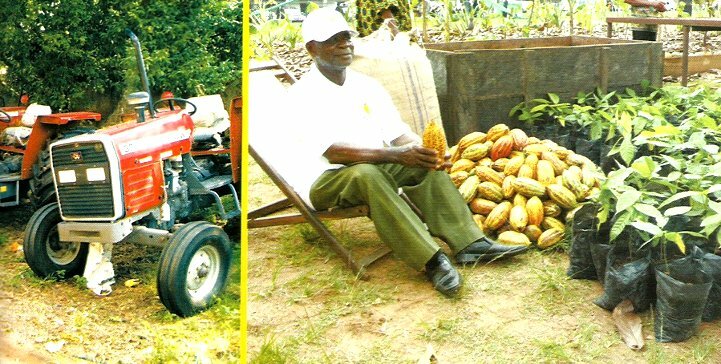 Over I million improved F3 Amazon Cocoa Seedlings distributed free of charge to Abia farmers. Oil Palm Estates in the State ceded to Foreign InvestorsLand acquired at Okwoyi for the pilot project of massive planting of plantains and bananas using the Songhai farm model.